KOSSAR’S BIALYS: This LES institution may be famed for its namesake bialys, but the $1 bagels here are nothing to sneer at, either. The shop underwent a recent renovation and now sells a slew of spreads, but the magic here is still in the bagel itself. Of course, if you’re feeling “adventurous” you can’t go wrong with a bialy—a pillowy round thing that looks a little bit like a bagel but will SURPRISE YOU when you bite into it and are overcome by the taste of onion—or try the “pletzel,” a savory, foccacia-esque flatbread. ABSOLUTE BAGELS: I was skeptical that anything could replace my cherished H&H. But thankfully, this uptown joint became the new neighborhood king, selling crispy-crust, light and chewy bagels to the hordes of Upper West Siders and hungover Columbia students that line up outside on weekend mornings. Individual bagels run about $1.25, and you can pair them with an assortment of standard cream cheeses, meats and spreads; do note that, much like H&H, while the bagels are delectable, they don’t hold up to snuff after a few hours, so it’s best to consume them ASAP. They are also suitable for making pizza bagels, if you are the sort of person who finds that kind of abomination acceptable. MURRAY’S BAGELS: Murray’s broke my heart last year when they gave in to transplants’ demands and began toasting fresh bagels, a move I consider a great bagel shop’s greatest crime. Still, an everything bagel with lox spread is a work of art here. 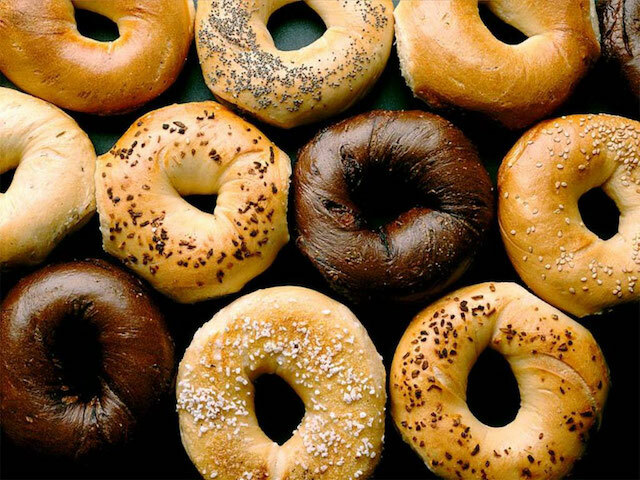 Go early to get the freshest bagel, skip the toaster and leave in the embrace of bagel-eating angels—note that there’s also a location in Chelsea, but the 20-plus year old Greenwich Village spot is above and beyond the best one. WHAT’S on an EVERYTHING BAGEL ?? ?